In 2013, Jack Krawczyk joined Pandora to formalize its first product management team dedicated to advertising. With years of experience under his belt from StumbleUpon and Google, he was charged with not only shipping clever products that would make ads palatable for listeners, but with rallying a quickly growing team around this effort. Krawczyk has seen a lot of ideas that have grown to become products, and others that never saw the light of day. His team’s advertising products frequently lead to creative solutions, but also to a lot of dead-ends. With these experiences behind him, Krawczyk has steadily risen through the ranks at the company. He’s emerged with six concrete tactics product leaders can use to not just build remarkable products, but talented product managers. In the 1990s, British anthropologist Robin Dunbar proposed that humans can only comfortably maintain 150 stable social relationships, which represents the cognitive limit given the average human’s brain size. For Krawczyk and his product development team, this concept resonates in their work. The core of their jobs relies heavily on building real relationships both broadly and deeply within the company while not overextending. Small product teams need to congregate. Krawczyk recommends that when a product team is under ten people, it should take advantage of its small size to get everybody in the same room as often as possible. Invite engineers and designers to join, and integrate them into the planning meetings. At Pandora, this has not only strengthened the relationships of those working on product, but it has also increased the likelihood that each PM leaves the meetings with a holistic understanding of the product and its status from end-to-end. In Pandora’s early years, former CTO and EVP of Product Tom Conrad instituted a “dollar-decision-making system” for all employees who touched Pandora’s product. In each quarterly meeting, attendees from across the company discussed the Pandora’s most important products and initiatives. To ensure active participation and prioritization, each attendee would receive five “dollars” to invest in the areas they believed to be most critical. Though the amount was small, it forced people to think through their wager. For many startups, this system works well when product teams are small enough to keep the conversation manageable. Despite its increased headcount, Pandora still uses the dollar-decision making system, but in a distributed way across various product management teams. For example, the advertising product group has a dedicated “dollar-decision” budget to inform its roadmap. Ultimately, the key is to recognize and take advantage of close conversations involving different functions. This is the fuel that will propel the company to grow. Larger teams need to get serious about process. “One of my most interesting challenges has been how to keep the collaborative nature of Pandora’s early decision-making process, but adapt it to serve our growing and specialized teams,” says Krawczyk. When Pandora was less than 500 people, open-invite, intimate town halls about product development worked well. But now the company is over 1,600 employees strong, including more than 25 product managers and directors. Using the same tactics would lead to chaos, circular conversation, and limited relevance for those involved. As soon as you need an ‘overflow’ room for product meetings, it's time to really buckle down on process. When Krawczyk started at Pandora two years ago, there were three product managers focused on advertising. During his tenure, it has grown to 12 PMs, some of whom are new to product development and others with over a decade of experience. The 12 product managers work with over 55 engineers, who to a certain extent, are also on Krawczyk’s radar. To keep community and efficiency in his team, he has organized his group into three functional pillars, which cover advertising end-to-end: listener advertising experience, ad distribution technology and advertising buyer experience. Krawczyk assigned one group product manager to each pillar. Each group product manager manages four PMs, and each product has a designated lead. This structure helps facilitate fast, focused meetings by vertical and anticipates a growing PM team. This realization really hit home for Krawczyk when his PMs, engineers, sales marketers and operations team left weekly meetings with seemingly different understandings of what had been discussed and decided. He would hear these types of rifts emerge in hallway chatter and subsequent conversations. If this disconnect occurred with everyone together, what would happen when the team grew too big for one-room gatherings? In order to catch these situations, as a manager, you have to speak with enough people to make sure there's unified clarity around the work at hand. After one fruitless meeting, one of Krawczyk’s product managers had an idea: Distilling relevant information into tiered documentation. One day, a PM on Krawczyk’s team noticed that, on one on side of the room, there were engineers referencing their massive Product Requirement Document (PRD), chalk full of specs and user stories, and on the other side sat a contingent from the marketing team referring to their planning documents. In an effort to bridge the gap, the PM decided to extract the relevant marketing information from the PRD and put it into a separate document, but retained its format so it could map back to the PRD. That way, he’d create a useful and familiar document for both parties to use — and an easily actionable plan for the rollout team. Executive Summary: an abstract of what the product management team is working on overall; the highest level rundown and a great place to start to get up-to-speed quickly. Wiki Pages: Central, intranet pages organized by product management pillar; a high-level snapshot of each focus area. It includes engineering statuses and operational milestones to hit. Wikis have a progress map for each pillar and timelines by quarter. Product Requirements Document (PRD): The comprehensive planning document, including standards, product specifications, user case studies, etc. This should be an end-to-end, one-stop-shop, detailed product plan. 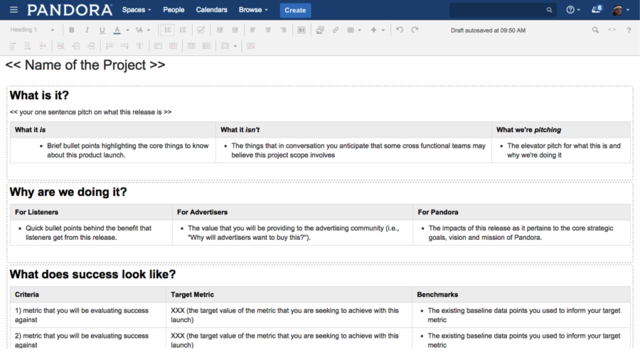 Launch Plan Document: A composite of all operational planning documents to coordinate every effort between all teams, including product management, sales, marketing, and development. This was adopted a little over two years ago due to Pandora’s scale. Succinct summaries and concise communication. “Each wiki links to an executive summary, which helps keep all stakeholders on the same page, even if they are spread across 38 offices.” There is also a section prompting PMs to deposit pithy pitches of what they are working on and why — a helpful exercise and reference point if talking to colleagues, customers or Pandora’s leadership. If documentation is critical for a product manager, it’s indispensable for a leader of product managers. For Krawczyk, communication is intimately tied to a shared understanding not only of the topic at hand, but also an opportunity to take or give ownership. Iterate how you communicate as much as it takes for everyone to understand the critical information. Several months ago, Krawczyk faced a situation where he wanted to change the way he was reporting on one of his advertising product management pillars. It happens all the time. A successful product manager is asked to lead a team of product managers. Though she’s superb at product management and is driven by creating and shipping products, she finds herself spending most of her time managing people — and becoming further and further removed from actual product management. Krawczyk felt the same until, like any savvy product manager, he reframed the challenge. To be a good product team manager, you need to have been a successful product manager first. Set up advanced listening mechanisms. Tactic: Start by asking your product managers open-ended questions that a customer might ask when first interacting with the product. A product management team should be designed to anticipate these questions and supply answers before anything is ever released. What questions might your team have for customers? Enumerate those as well. Encourage your product manager to get out in front of customers — but then listen to them as consumers. To do this, Krawczyk encourages PMs to sometimes ask questions without mentioning Pandora: "What’s the one product out there that you’re most excited about right now? What are the brands that you try to emulate? What are they doing that’s really great?" Keep your feedback loops healthy at all costs. Krawczyk has established a series of weekly one-on-one meetings and two team check-ins — a product meeting on Mondays and a logistics meeting on Wednesday. These sessions not only give his team defined opportunities to voice concerns, but also help him stay knowledgeable since he’s more removed from day-to-day developments. He uses a dashboard to keep a pulse on what’s important, but these meetings help to confirm or adjust his understanding. “Monday morning at 9:30 a.m. is my most important time of the week, as it’s when the full product team of over 25 product directors and managers convenes. It starts with a pre-read of our wiki pages, so we make the most of our time together identifying insights and reviewing more in-depth product releases,” says Krawczyk. Our conversation can include more thorough updates, but also cover proposals to tackle future challenges. Several have resulted in new features put on our roadmap. “During that Monday group meeting I’m scribbling down all the notes that I would like to follow up on with individual product managers — either to share with their group product managers or directly via Slack,” Krawczyk says. Tactic: Establish a consistent set of group and one-on-one meetings, ideally early in the week to help set the tone and get the team on the same page. Sequence them so their impact compounds; one can be about information gathering and the other addressing the issues that arise. Vary the meeting size so participants have a choice of venue to raise an issue and can determine when it’s most comfortable or relevant for them to do so. Your team should have a purpose as clear and obvious as a product's purpose. Autonomy – Self direction is the innate motivation. Those driven by autonomy value trust and dislike micro-management. Krawczyk has taken this framework to work more effectively throughout Pandora. As he notes, “I’ve worked with certain types of people that are just fascinated by complex math problems or throughput and scale problems. Others really want to have the most elegantly designed user interface.” One of his goals is to help his team learn how to better understand the way people across the company tick and use that information to complement their style. Tactic: It’s common to investigate user motivations or market behavior when building and releasing a product. Do the same for your product managers to understand what will make them succeed and how this aligns with your group and company’s mission. Discern what motivates your product managers and incentivize accordingly. Provide the right amount of runway. 1. Stay firmly grounded in reality. Especially if you're building a new product from scratch, it can be easy to postulate and plan any number of pie-in-the-sky features. And indeed, a good product leader will squeeze as much creativity as possible out of the PMs they manage. But asking someone to think big without giving them the resources to execute is utterly deflating. “You never want to delegate work to PMs when they don't have the engineers to do it,” says Krawczyk. Make sure the ideas you generate are grounded in reality. And if some end up being further afield, schedule them down the line in a way that makes sense. Develop your team alongside its metrics for success. 1. Move from “fire”-based to product-based product management. It’s not uncommon in the world of startups to have three product managers across a young company. One might report to the CEO and the two others to a founder, who was the original product manager. This lack of structure and focus frequently produces PMs who are managing a lot but not for any one product in its entirety. “If you only focus on the next pressing issue, you can get stuck making local optimizations indefinitely, which leads to amorphous product development,” says Krawczyk. It’s wildly important to regularly exalt and publicly amplify the good work your team is doing. 1. Know where the spotlight belongs. If Krawczyk’s team launches a great feature and Pandora is covered in Ad Age, he wants to be very clear that it was accomplished by the product manager, as well as her peers on the engineering, design and business teams. Additionally, if there’s an external blog post about a feature launch from the team, he doesn’t want it ghost-written for him. The product manager is the owner of his product, and so should also be the author of its story. There are few proactive steps he takes to identify top talent on his team and intentionally develop people into role models and managers. Often, it's a process that starts before they even come aboard. Articulate the mission early in candidate interviews. For Krawczyk, the most telling part of an interview is the discussion of the company’s mission. It not only reveals the candidate’s excitement and engagement for the company, but also shows if he knows why it exists and how he might contribute. Hire listeners that display intellectual curiosity. At Pandora, candidates applying to the advertising product management team will start with a phone screen or in-person meeting with Krawczyk. He likes to ask, “What have you last taught yourself?” This question gets to the heart of how applicants think through challenging themselves. If there’s rapport, candidates have two rounds of interviews with a panel of product managers, including one from a relevant pillar. After that, applicants speak with a group product manager from another team, marketing partners and an engineer. At the end of the interview process, Krawczyk asks candidates to replay what they think the job is and measure it against how the job is structured. Pandora’s mission is to be the effortless and endless source of music discovery and enjoyment for billions of people. Krawczyk never lets his team forget that everything must roll-up and contribute to that greater goal. Throughout his career, he’s been asked to answer some difficult questions: "How will a new product get people to listen longer and longer? Will this resonate with people or just annoy them?" Every day, Krawczyk returned to the company's mission to answer these questions. Even today his computer’s screen saver loops his mission, which stays with him like a battle cry: "Unleash the infinite power of music to enable brands to resonate with listeners!" Working in advertising is very much like being in the CIA: When you’ve done your job well, no one notices, but if you screw up, then the world hears about it. Most importantly, as a product leader, you must understand that your role and purpose is innately human — even if it may not seem like it immediately. Being able to mine this deeper motivation is critical for product leaders in particular, because they need to be able to inspire the sentiment in others. This is perhaps the most critical quality to embody. It’s imperative to connect ideas until you find the human, impactful center of whatever work you have in front of you.